The other night, or early morning, sometime after midnight, I was searching my TIVO when I ran across Jamie At Home. Jamie Oliver, whom I have loved since he was much younger and naked, had a show on the BBC called Jamie At Home which consisted of 12 shows. In the US, the Food Network has been showing the summer season, over and over and over. In the show, Jamie runs about his garden (carefully taken care of by a gardener.) Jamie gathers food he (read: his gardener) has grown and then he makes quick and easy dishes in a few minutes right before your eyes. 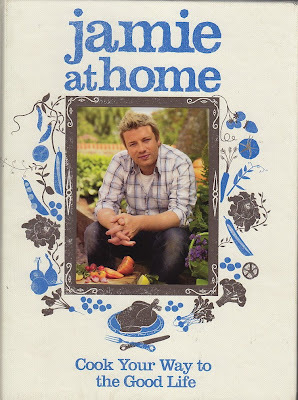 As always happens with TV chefs, the show was the perfect platform for a really large and pricey cookbook entitled, Jamie At Home, which, of course, I own. The show I re-watched (it was after 2 am and there was not a Law & Order on any channel, which is a really rare experience) was on courgettes. In the US of A we call courgettes “squash” of any of the zucchini, crook neck, summer yellow, pattypan variety. On the "squash" show he made a carbonara and it looked so good, I decided to make it. Boil a package of pasta of the penne variety. Cut up some bacon, then cut up 2 or 3 squash in slices or small sections the size of the penne. Throw the bacon in the skillet and cook till dark and crispy. While it’s getting crispy, mix a couple of egg yolks, a cup of cream or half–and-half and some Parmesan and set aside. When the bacon is crispy, add the squash and fry it until it a bit soft, and by the time the squash is soft the pasta should be done. Save a bit of the cooking water, then add the pasta to the skillet and remove from heat to cool down just a bit. Mix in the egg mixture quickly, add some of the cooking water and serve immediately. Heat a very large frying pan (a 35 cm one is a good start – every house should have one! 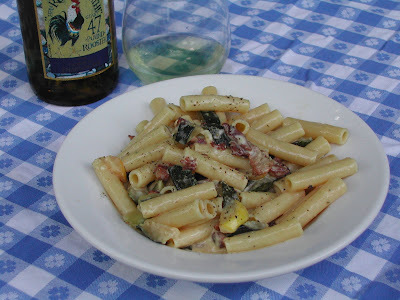 ), add a good splash of olive oil and fry the pancetta or bacon until dark brown and crisp. Add the courgette slices and 2 big pinches of black pepper, not just to season but to give it a bit of a kick. Sprinkle in the thyme leaves, give everything a stir, so the courgettes become coated whit all the lovely bacon-flavored oil, and fry until they start to turn lightly golden and have softened slightly. Get everyone around the table, ready to eat straight away. While you’re tossing the pasta and sauce, sprinkle in the rest of the Parmesan and a little more of the cooking water if needed, to give you a silky and shiny sauce. Taste quickly for seasoning. If you’ve managed to get any courgette flowers tear them over the top, then serve and eat immediately, as the sauce can become thick and stogy if left too long. Jamie At Home, the cookbook, features another of my favorite recipes, Venison Stroganoff , that we featured on the Cookbook of the Day blog.